Football Association of Singapore and the TAKE ACTION in Singapore Executive Committee (cooperated by Albirex Niigata Singapore and TAKE ACTION FOUNDATION) has decided to hold a charity match in Singapore on Saturday, April 2. They are inviting the TAKE ACTION team, represented by Hidetoshi Nakata, to support fundraising for the Japan earthquake and tsunami disaster. The proceeds through charity auction and the charity match will be donated to Japanese earthquake and tsunami victims. Also, we are accepting donations from all sponsors, and are calling out for further donations from Singapore cooperates. ※One person can purchase maximum 50 tickets. *Please be aware that the maximum purchase is 50 tickets per person. Press conference for the 「0e」was held in Singapore on Sunday, March 27. At the press conference, Singapore Mayor/President of Football Association of Singapore Mr. Zainudin Nordin and Hidetoshi Nakata, representative director of TAKE ACTION FOUNDATION, were present. There were comments about the Charity match on the 2nd of April held to raise funds for the earthquake and tsunami disaster in Japan, as well as question & answer session. ・Mr. Zainudin Nordin（center）: Mayor of Singapore as well as the President of Football Association of Singapore. ・Mr. Zulkifli Baharuddin （second from left）: Representative of S.League and Cares fund. We received enormous damage by this disaster but people in Japan are trying to reestablish by themselves. However, I feel that this time we need support from people around the world. This action is very valuable for both Singapore and Japan, regarding football in both countries as well, and has become a meaningful one. Football is not just a sport, it can connect people. What people in the disaster area need is not only money and food but also an unity. This match is important not only because we can raise funds, but also because we can draw attention to the serious conditions people in the disaster-stricken area are facing. Through this mach I wish to strengthen bonds between people. This is just the beginning and I would like this to be the trigger to open further opportunities to hold such events for continuous support to help the people in need. Football is not just a sport that scores goals. It can bring people from different background together, which will lead to a helping hand. 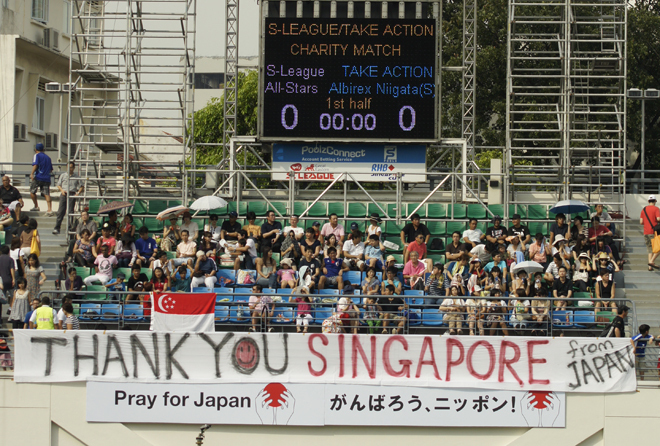 Through football we want to do everything that Singapore can do for Japan and for the disaster victims. I would like individuals, corporate, sponsors to help, and I believe that support from fans and stakeholders will lead to a successful as well. 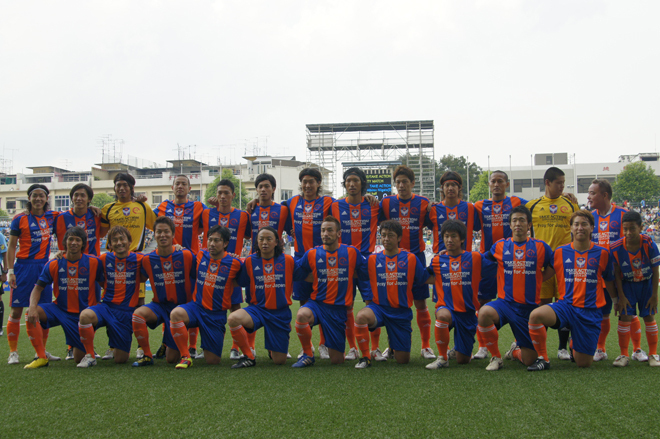 Albirex is a role model for the S.League. I was deeply touched at the board meeting right after the earthquake and tsunami disaster, when Mr. Korenaga addressed that he wanted to do something with Singapore for Japan. I feel that the reason why Mr. Nakata responded to a sudden phone call was because it is important for everyone to get together to work towards the same goal. This project including the match for the earthquake and tsunami disaster represents good relationship between Japan and Singapore. The fact that people have voluntarily got together for this good cause is valuable. There are still many people suffering from the disaster. That is why I want to support the earthquake and tsunami victims through football. I believe football can encourage people, and we feel happy for Mr. Nakata's quick response. We were able to make this happen much faster than I thought. I am thinking how we can save the world through football and am looking forward to this match being the first step towards it. Q1. How has the Japanese sports industry been affected by this earthquake disaster? 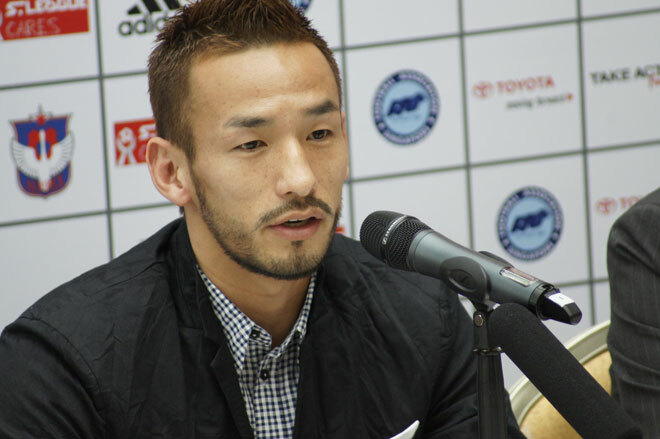 Nakata: I am not sure of the actual situation as I was overseas when it occured. But from what I know, football and baseball games have been postponed and I think there are many charity events taking place these days. Q2. At how many more countries are you going to hold a charity event? Nakata: We just started so we don't know yet, but there may be a chance to hold one in Europe. Q3. Do you have a set amount of how much you would like to raise funds? Nakata: I don't think this event is just for fundraising. Of course that is important, but I feel it is more important to gain worldwide attention about what is happening in the disaster-stricken area. I feel that I need to think of long term support for 1, 2, or 10 years so that this doesn't become a one off charity event. Q4.What are you offering at the Auction in Singapore? Nakata: I don't know what is wanted but, would like to offer what the participants desire. Q5. Can we receive advice for people who want to support Japan but don't know what to do? Nakata: I believe it is not difficult to do "something". Even just talking about it is ok. You don't have to think too deeply, just do what you can do. Not only sending supplies and doing something for the disaster victims is important, but it is also important to do something for people in your area. Most significantly it is vital for people around the world to connect through taking any form of action. Q6. Would there be any other forms of events in Singapore? Nakata: I am not sure at the moment. What I want to do is to start training for the matches. We don't have to do everything right at this moment. I want to continue to do something next year and the following year. This Charity match and Gala event is only a beginning. Q7. When did you decide to have a charity match in Singapore? Is this the first one? Nakata: At the time of the earthquake I was in Hong Kong and my flight was canceled so I could not go back to Japan. I felt that it would be faster to hold a charity event outside rather then within Japan. Last week I appeared on a charity program in China and Taiwan, so this is not the first charity event I was involved in. I still want to participate on other things and not let this be the last one. Q8. How did you get Mr. Nakata to participate? Mr. Korenaga: There was a board meeting on the 14th, and on the 16th, I told Mr. Nakata over the phone, on what we discussed at the meeting. And he accepted the offer right away. The proceeds through the admission fee from the charity match and charity auction will be donated to the earthquake and tsunami victims. Also, we are calling for relief money from Singapore cooperates and also accepting donations from cooperates who support this activity. 6,000 crowds PRAY FOR JAPAN in Singapore!! Saturday, April 2, 2011, SINGAPORE- TAKE ACTION with Albirex Niigata Singapore beats S. League All Stars by 7-2 in a charity match held at Jalan Besar Stadium in Singapore. This match is to raise funds for the victims of the earthquake and tsunami disaster in Japan. Hidetoshi Nakata and his TAKE ACTION team mates, Tsuyoshi Kitazawa, Masaaki Sawanobori, and Masakio Maezono, who are former national football players, teamed up with Albirex Niigata Singapore from S. League club to play against the S. League All Stars. 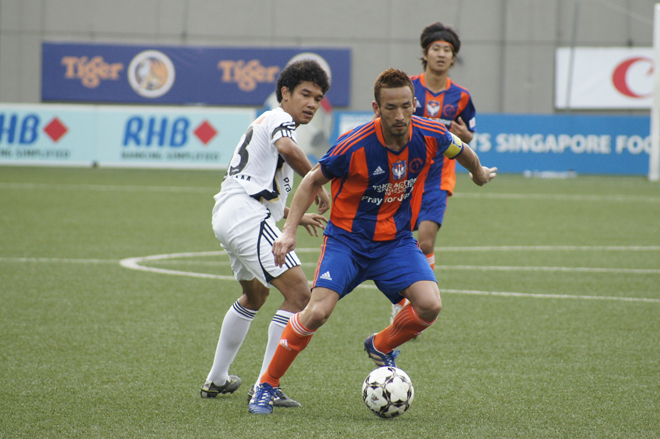 The match started off with Bruno from Albirex Niigata Singapore who set up his first goal at 17 minutes after the kick off. With both veteran players, who have experience, and young players, who have speed and power, they made good combination. Kitazawa entertaining the audience by putting pressure on the opponent and constantly going for the goal which led Nakata to score a goal at the second half. Before the kick off, there was a moment of silence to commemorate the victims of March 11. Also a successful bidder from the charity auction held on March 31st, joined to play at the second half. He had won the bid to have the chance to play for 5 minutes with the players during the match. The bidder also invited a 14 year old orphan, who made the PK followed by another goal from a pass made by the President of Albirex Niigata Singapore. Tickets were sold out the day before the match. The proceeds through the admission fee from the charity match and charity auction will be donated to the earthquake and tsunami victims. Also, we are calling for relief money from Singapore cooperates and also accepting donations from cooperates who support this activity. Q1　How does is feel to play for 45 minutes? Nakata： It's been 5 years since I've retired from football, so it was tough. But I wish I could have played for 90 minutes. Q2　How did it feel when you made the goal? Nakata： It felt good. Other players made goals too, so it felt even better. Q3　How do you feel playing in Singapore? Do you feel that this charity match was a success? Nakata： I love the stadium, and it was very meaningful to have so many people come here. This match was not just about money, but how many people contributed themselves for the people in need. And I think this meant a lot to the Japanese people. Q4　How long do you plan to continue this charity activity? Nakata： As long as I can. At the same time, I am organizing matches with other countries in Europe and Asia. I've even spoke to the FAS President that maybe we can have another charity match next year here in Singapore, maybe during a cooler time. Q5　Could we have a word from you in Japanese? Nakata： I am very grateful to have so many people come to the stadium today. I would like the media to send this message to Japan that many people from all over the world cares and is supporting Japan. I think this charity match hadn't succeeded if it wasn't for all of you who came to the stadium today. Thank you. The Executive Committee of TAKE ACTION in SINGAPORE (cooperated by Football Association of Singapore and TAKE ACTION FOUNDATION) has announced the proceeds for the charity match held on Saturday, April 2nd at Jalan Besar Stadium in Singapore. Proceeds of 11,842,250 JPY will be donated to the Red Cross for relief activities of earthquake and tsunami disaster in Japan. The funds were raised by match admission fee, donation boxes on site, and charity dinner gala. This charity match was held to raise funds for the victims of March 11, when Nakata first received a phone call from the Football Association of Singapore (FAS). 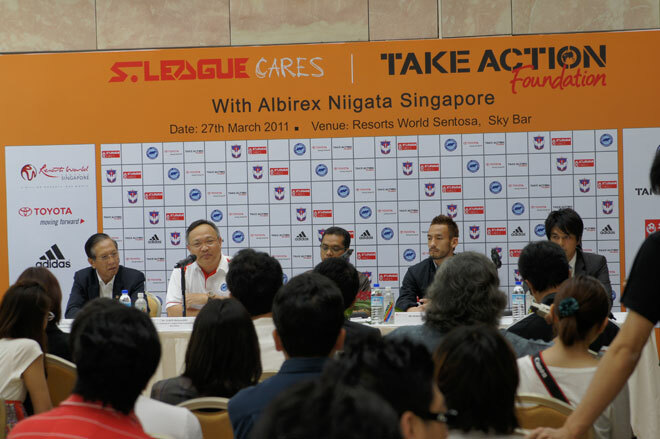 With the support by FAS, Albirex Niigata Singapore from the Singapore League, and Resort World Sentosa, this charity activity was quickly arranged and put into action. Charity dinner gala was also held on March 31st inside the Universal Studio. Items, for example, Nakata's uniforms and the right to play for 5 minutes with Nakata were bid at the charity auction. On the match day, 6,100 people gathered at the stadium to "PRAY FOR JAPAN", and more than 17,000 viewers watched the charity match live on USTREAM.